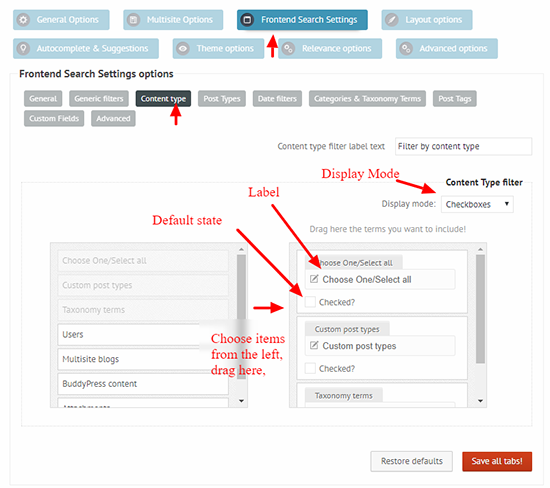 In cases, when you need to return multiple content types as results - such as posts, users, attachments, taxonomy terms etc.. - this filter allows narrowing the results to selected content types only. This filter will only work for content types which are already enabled. For example: If the attachment filter is selected, but the search in attachments is disabled, then it will have no effect. Changes the layout of the overall option, by default set to 'Checkboxes'. Choose the items you want to use within the filter from the left side of the list to the right side. Radio or Drop-down -> Acts as a 'Choose One' option. When selected, the filter is ignored.